Shantinitekan as the name suggests, “abode of peace”, is truly the abode where a soul can discover peace of mind. The nature God had gifted the place with immense natural beauty in the form of housing a huge collection of flora and fauna. It could be a real feat for any professor of botany. 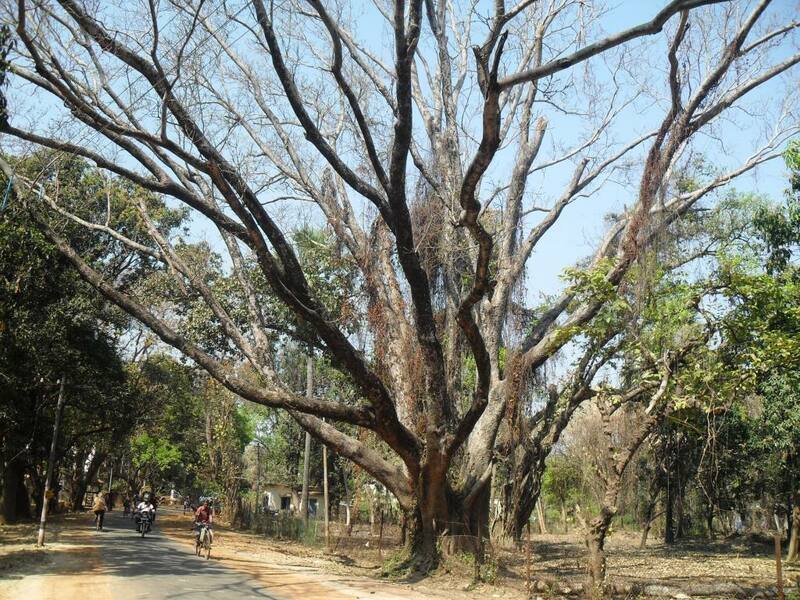 We could not stop adoring the natural beauty of the large trees all around us. The gigantic mango trees, banyan trees, pipul trees, and the dark sal woods in the backdrop created a long lasting impression on our minds. In order to enjoy the feat of the rural Shantiniketan we moved out of the busy streets of the town towards the Kopai river banks which is unfortunately now been under the scanner of resort sharks. Utterly disappointed, we decided to ask our cab driver to take us out towards the rural areas. The views around us were mind blowing. It was spring – the crop fields were lush green. 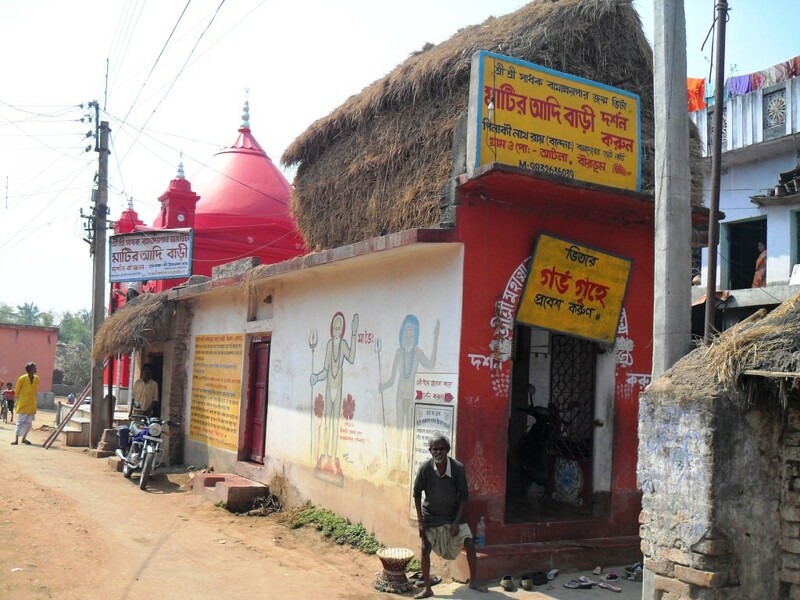 Kangkalitola is famous for the temple of Goddess Kali, one among the 51 Shakti Peeths of the Divine Mother. References from popular Indian mythology and ancient Hindu texts indicate that after the demise of Goddess Sati, in order to protect the destruction of the known world from the rage of Lord Shiva, Lord Vishnu had severed the her divine remains into 51 pieces which fell on our world and were subsequently worshipped as 51 Shakti Peeths. It is said that at Kangkalitola of Birbhum, parts of the Goddess’s skeleton had fallen. We reached Kangkalitola by taking the Bolpur Labhpur road after crossing the rail gate of the Prantik railway station. 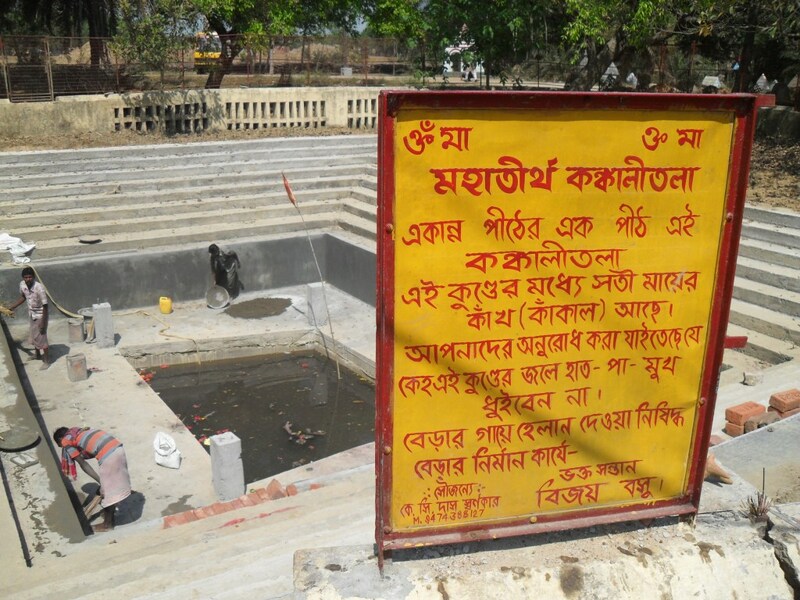 Kangkalitola is a very simple temple located on the banks of river Kopai. Unlike popular temples of Goddess Kali, the main sanctum does not contain any deity like that of the famous Jwalamukhi and Kunal Pathhari Temples in Himachal Pradesh. The ambiance of the temple is serene and far from the hue and cry of the busy city life. The temple attracts huge pilgrimage during the festival times like Durga and Kali Pujas as well as on Tuesdays and Saturdays of a week which are celebrated as the days of Devi Puja. The large mango tree garden adjoining the temple is worth mentioning. During festivals the pilgrims organize community kitchens on these grounds for cooking “Bhogs” (meals for the Goddess). These are the special moments which one should witness if you visit Kangkalitola from Shantiniketan. You visit to Kangkalitola would remain incomplete without spending half an hour roaming on the banks of the river Kopai which lies adjacent to the temple. The little dried out almost dying river is a feat of natural beauty. Surrounded by eucalyptus woods, palm trees and the lush green farm lands is a visual treat for any tourist and nature lover. The most amazing spectacle is created by the narrow, serpentine red-soil village roads. This is something so beautiful and heavenly that Tagore had repeatedly mentioned the beauty of the “Ranga-Mattir Poth” (Red-soil path) in his eternal poems and songs. We closed our eyes by standing on one such village path, with the greenliness madly adoring us and enjoyed the cool breeze touching our souls. We felt Tagore and his eternal melodies all around us. Guys this was the magic, this was the sheer joy we had at the blessed soils of Shantiniketan. Dear readers you can have the taste of exquisite traditional Bengali cuisine at any standard restaurant and food joint at Shatinitekan located near to the town Bus stand. Our trip was over by 3.30pm and we obliged ourselves for a delayed lunch at the “Ghare Baire” restaurant. The food was superb. The veg-thali meal had mouth watering items like basmati rice, uchher shukto, mugger dal, crispy aloo bhaja (potato chips), begun bhaja (brinjal fries), postor-bora, alu-posto, shahi paneer, dhokar dalna along with mishit doi (sweet curds of Bengal) and Rajbhog (Giant Rasogolla) as dessert. 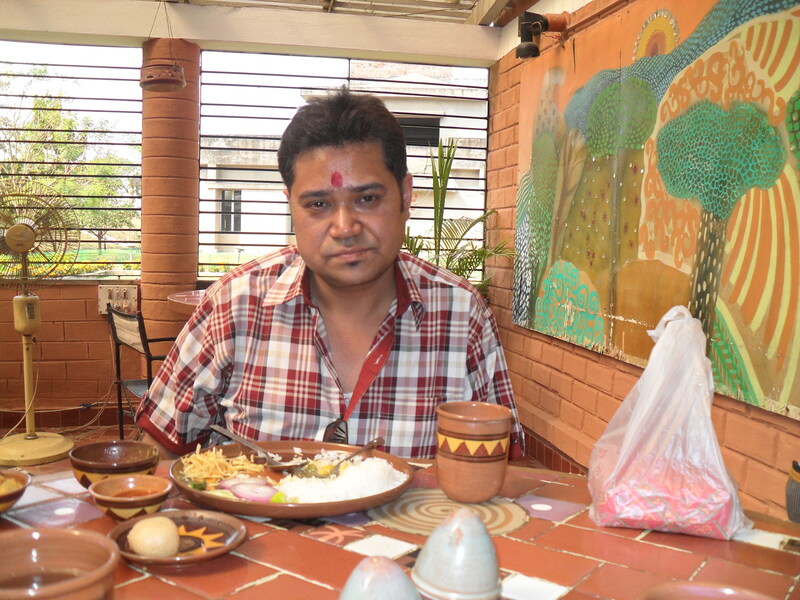 The uniqueness of this restaurant is that the visitors are served foods in the traditional Bengali way, with the staffs of the restaurant dressed in Bengal Kurtas and dhotis. 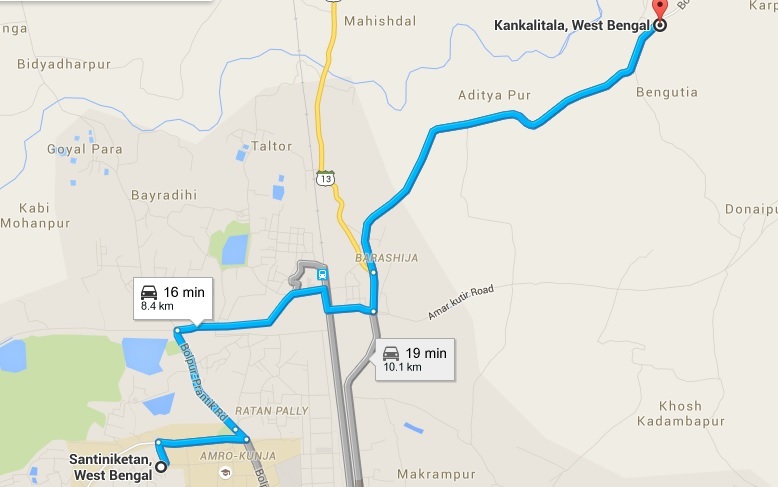 After spending the night at Shantiniketan our next destination was an early morning journey to Rampurhat. We took the NH 2B (Pangarh-Morgram Highway) Extension after crossing the Prantik railway station. After reaching Fatehpur we proceeded further north through the Pangarh-Morgram Highway and turned right at the Atla more taking the Tarpeeth Road from the highway. 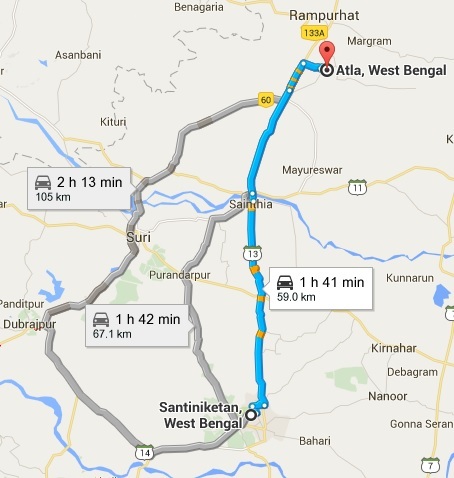 The 59 Km journey from Shantiniketan took us about 1 hour 20 mins to reach our destination. When we reached Atla village it was just going to be 7am in the morning. Atla village is immortal for the great Tantric sage “Shadhak Bamakhepa” (mad sage). Among the great sages worshiping the Goddess “Shakti or Mahamaya of Kaali”, Ramkrishna Parahamsha Dev, Shadhak Bamakhepa, Ramprasad are immortal for their divine linkage with the Goddess Mahamaya. 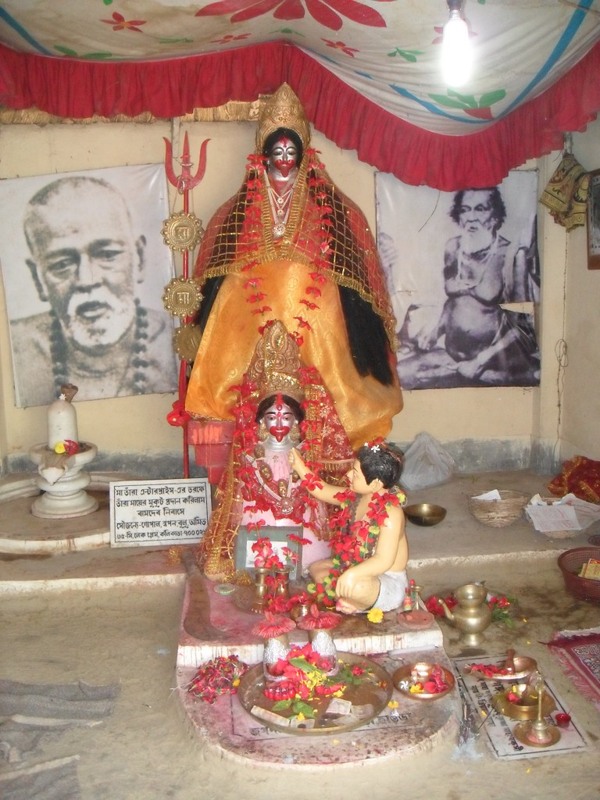 It was Shadhak Bamakhepa who had worshipped the Goddess as Devi Taramaa at Tarapeeth. Tarapeeth also happens to be one among the 51 Shakti Peeths where the Devi’s divine eyes “Tara” had fallen after her body was body was decimated by Lord Vishnu. The Atla village just presents a perfect picturesque postcard view. Mud huts in the back drop of bamboo woods lined by tall palm and mango trees, ancient banyan trees, small ponds with ducklings swimming around and the lush green paddy fields extending to the limits of one’s vision are just too good to digest. 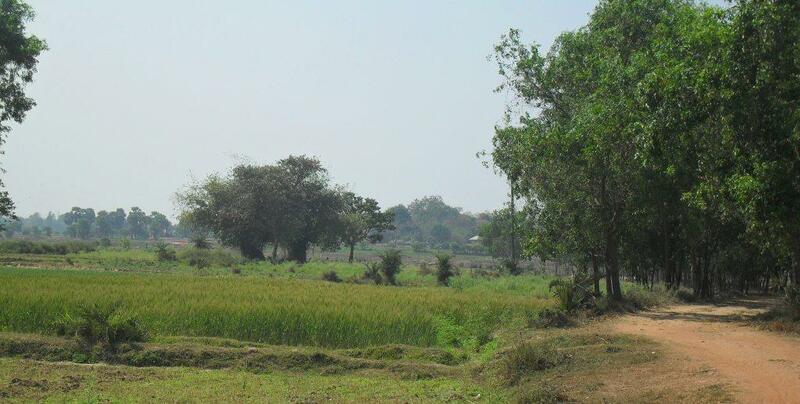 As we have mentioned earlier, this is where the rural Bengal is at its natural best. We visited the residence of Shadhak Bamakhepa at Atla Village. 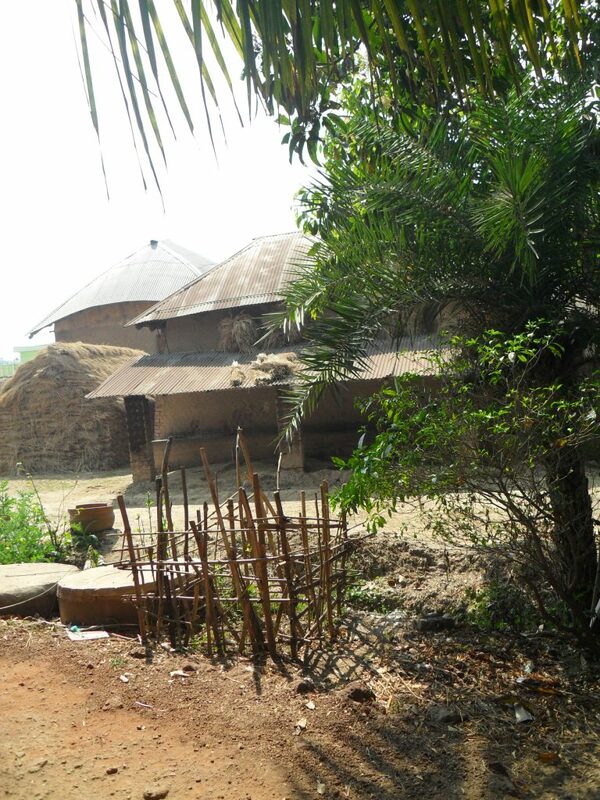 Even after so many years it exactly looks similar to any other village hut in and around Atla. 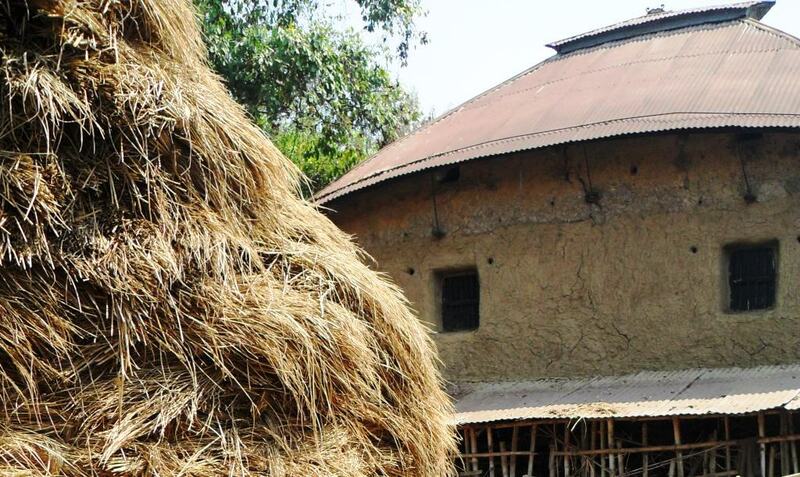 The holy mansion (rather hut) is a simple mud cottage with roofs thatched by hays and dried leaves. 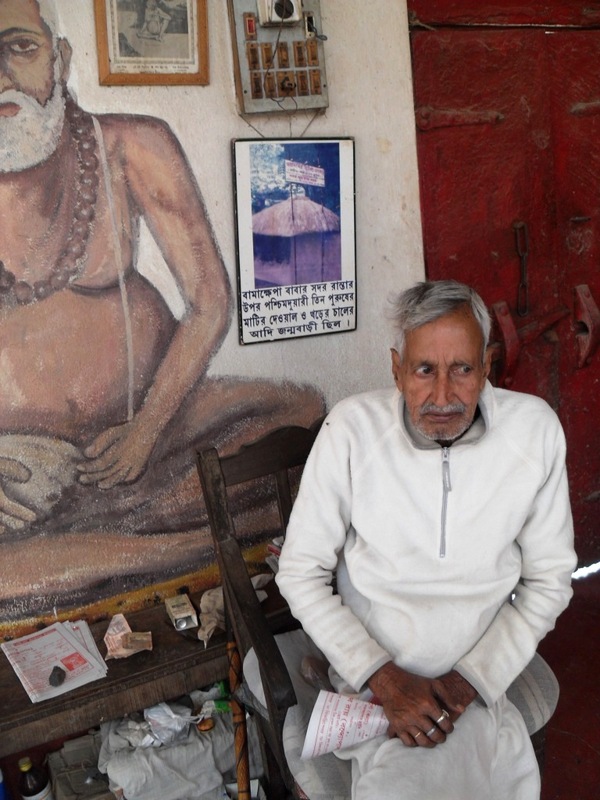 At present the descendants of the great sage lives in a humble pucca mansion and they have built a small temple in the basement claiming that the sage had used to meditate in this small room. We met the elderly person who was one of the descendants of Shadhak Bamakhepa. 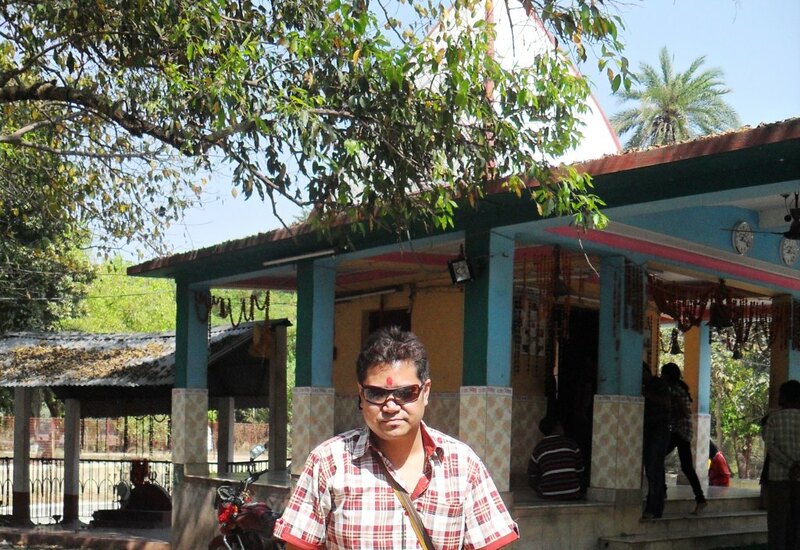 Tarapeeth is one of the most important holy places in Bengal. It is one among the 51 Shakti peeths were Devi Durga or Shakti or Kaali is worshipped in the name of Goddess Tara. For offering prayers the devotees have to keep standing for hours in long ques to get their turn for having the darshan of the Devi in the temple. We had to spend full two hours to complete the Darshan and offer Pujas in the temple. It was time for us to return. This small yet significant tour had a long lasting impression on our minds. 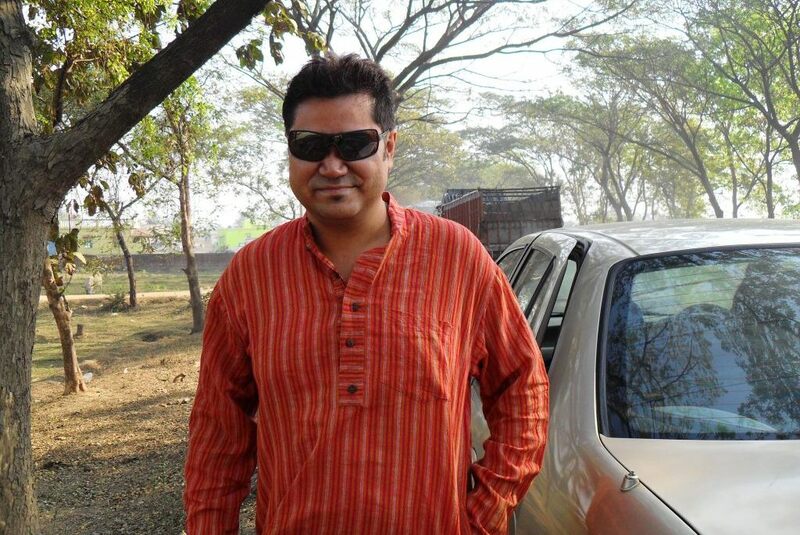 It showcased the beauty of rural Bengal and the magical aura of Birbhum’s “Ranga-Matti” (red soil). 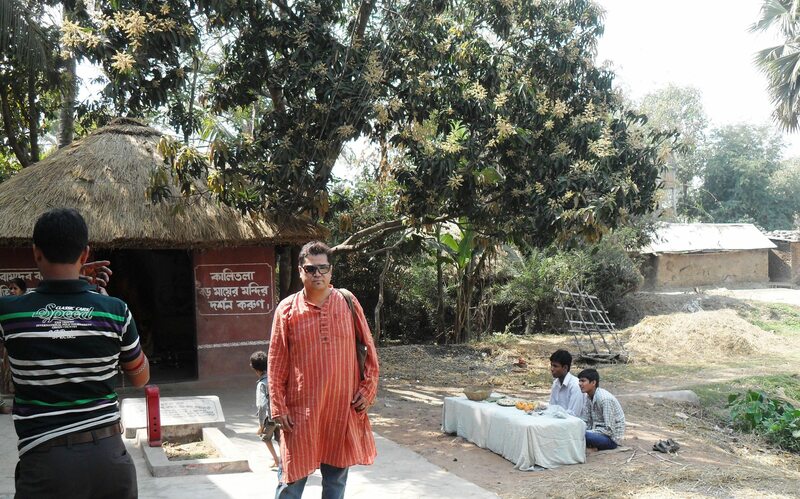 Although he was our all time idol, we came much closer to Tagore by feeling him everywhere at Shantiniketan. We shivered with joy and thrill when we entered his private rooms at his residence. His verses and melodies were still attuned with every living and non-living objects in and around Shantiniketan. It was perhaps the destiny written by the Divine intervention to bless this known world with a personality like Tagore to be the inspiration behind nurturing talents in so many great scholars and learned people of our country at the University founded by him. 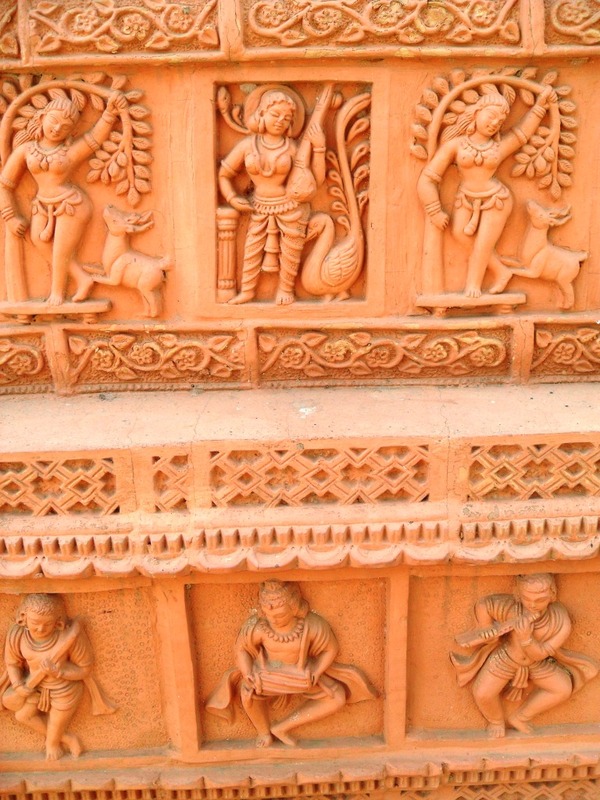 …..The Ranga-Mattir Desh or Birbhum is truly a land where “Art, Devotion, History, Achievement and Nature is at its best”……..